“To die for one’s country is an act of love for your fellow beings and we honour them today.” said Archbishop Davies, as bells rang out marking 100 years since the end of the Great War. 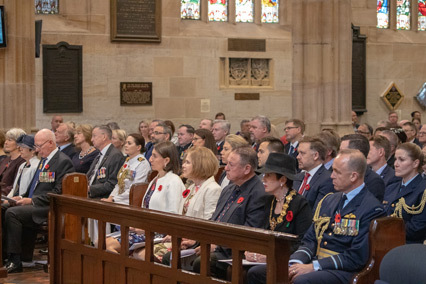 The Governor, Premier and Lord Mayor gathered in St Andrew’s Cathedral, prior to the official service at the Cenotaph, to give thanks in the same way, even using some of the same words as the Cathedral service in 1918. The words of Jesus read by our Premier (who read the New Testament reading) state it so eloquently: ‘Greater love has no one than this - to lay down one’s life for one’s friends.’ Jesus’ death brings hope, his cross signals the end of death. And this was known by many soldiers in World War I, where their headstones reveal a hope that is secure beyond the grave. 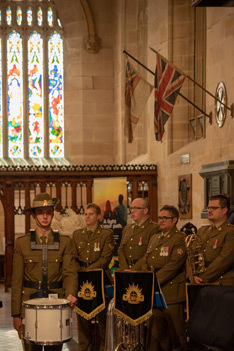 “One hundred years ago, the bells rang out from churches across Sydney to celebrate Armistice Day. 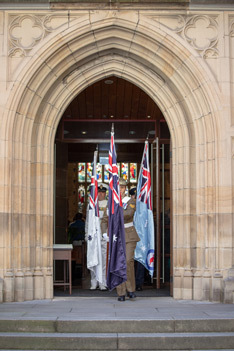 The bells of St Andrew’s Cathedral will be rung this morning at one minute to 11 for the same purpose, and as the Town Hall strikes 11 o’clock, I trust those in George Street will take the opportunity to stop their hurried lives, pause, pray, and give thanks to God for the peace that we enjoy in this land.” the Archbishop said. The tenor bell rang solemnly for one minute at St Andrew’s Cathedral as bells from Anglican and other churches across Greater Sydney and the Illawarra also rang out. At St Michael’s Cathedral in Wollongong congregation members wrapped 55 poppies around a large pine tree in memory of the 55 men on its Honour Board. 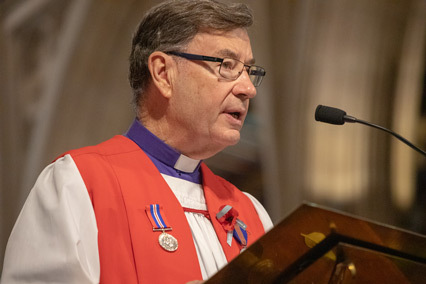 “Yet the peace that passes all understanding is also to be grasped, at God’s gracious invitation, which too was won at great cost, the costliest death of all, accomplishing the death of death itself.” Archbishop said at the conclusion of his sermon in Sydney. “It is not without reason that Jesus is described as the Prince of peace, for he alone brings that lasting peace, that surpasses the temporality of this world, that bring us the hope of sins forgiven and an inheritance of everlasting life.